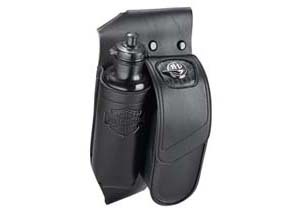 KU-89: These handy pouches securely attach to Harley-Davidson models equipped with saddlebag guards, offering up convenient external storage for quick access to cell phones, wallets, firearms or other small items. 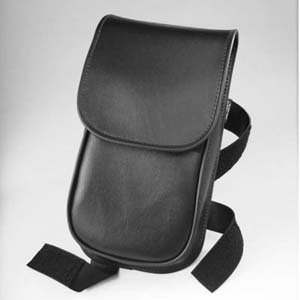 Sold in pairs, features include a larger main compartment with heavy-duty magnetic closures, and a smaller external expandable pocket with high-strength Velcro closure. 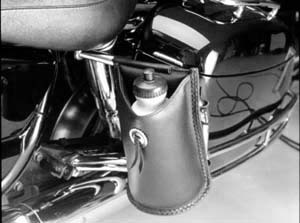 RB-112: This right or left side classic rail bottle holder mounts around the saddlebag guard rail on FLH models with heavy duty snaps, making installation a snap. 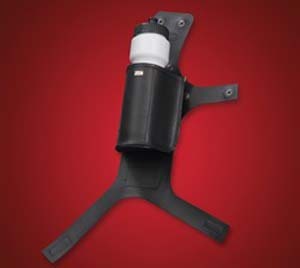 The 6 ½” x 3” x 5” Bottle Holder twists into an EZ Mount™ and holds up to a 3” diameter bottle (28 oz sports bottle included). Made in the USA. Fits up through 2015 model years. 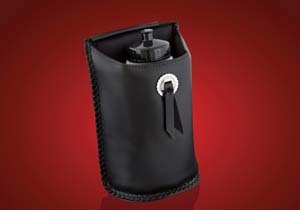 HD-105: Our beverage holder is insulated to keep drinks cold. 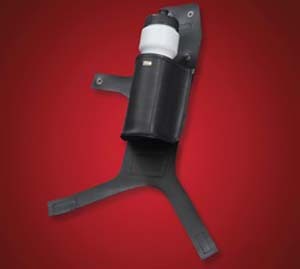 It has a hook and loop attachment which makes the holder adjustable and secure, preventing it from slipping. 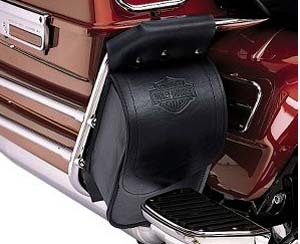 Fits most Harley-Davidson Touring Models attaching to the left saddlebag guard rail. Beverage bottle included. 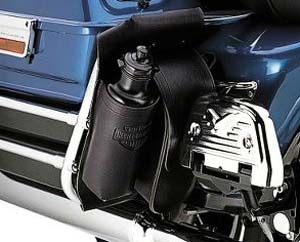 HD-SRB: This Saddlebag Rail Bag provides convenient extra storage plus protection for the front of the saddlebag from bugs and paint chips. It has a hook & loop attachment (instead of snaps) which makes this bag adjustable and secure, preventing it from slipping. Fits touring models. Made in the USA. Dimension: 7" wide by 13" long. 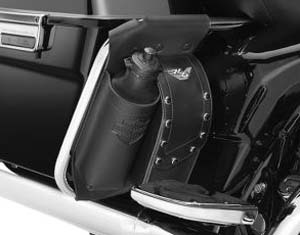 CBB-31: Economical black crash bar bag attaches securely to the rear crash bar on Harley Davidson FL Models. Also featured is a plastic bottle that snaps in place. 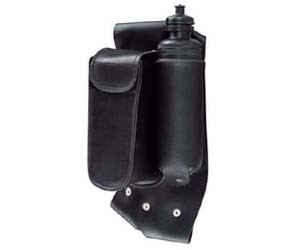 This combination bag includes the water bottle holder and water bottle and a separate compartment for additional storage. Storage bag is Waterproof. 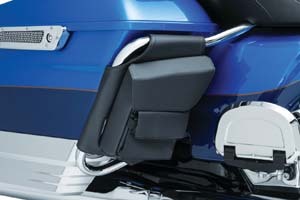 For standard Harley-DavidsonTM saddlebag guardrails only. Fits Road Kings, Ultra Classics, Classics. Available in leather. Special order item. 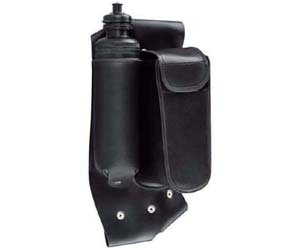 CBB-99: Saddlebag Guard Bag and Water Bottle Holder - Bar & Shield Logo. This sturdy synthetic bag features an embossed Harley-Davidson® Bar & Shield logo, a hook-and-loop outer closure on the storage bag and a zippered inner closure to securely keep easy access items such as sunglasses, wallets and cell phones. This bag also features a removalbe water bottle with the Bar & Shield logo, providing accessible water anytime on long trips. 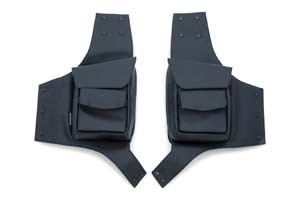 Right Side, fits '93-later Touring models equipped with saddlebag guard rails. Does not fit Comfort Profile Guard Rails. Left Side, fits '80-later Touring models equipped with saddlebag guard rails. Does not fit Comfort Profile Guard Rails. 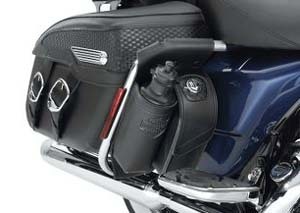 CBB-05: Saddlebag Guard Bag and Water Bottle Holder - Road King® V-Logo. This sturdy synthetic bag features an embroidered Road King® "V" logo, a hook-and-loop outer closure on the storage bag and a zippered inner closure to securely keep easy access items such as sunglasses, wallets and cell phones. This bag also features a removable water bottle with the Bar & Shield logo, providing accessible water anytime on long trips. 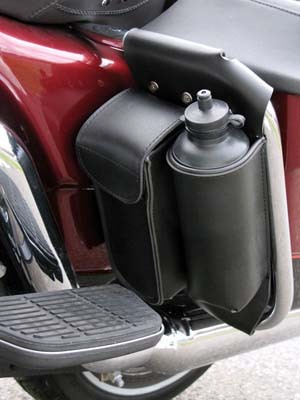 CBB-13: Saddlebag Guard Bag and Water Bottle Holder - Road King® Classic Concho. This sturdy synthetic bag features an embossed basket weave panel and chrome concho to match the Road King® Classic model. The storage section features a hook-and-loop outer closure and a zippered inner closure to securely keep easy access items such as sunglasses, wallets and cell phones. This bag also features a removable water bottle with the Bar & Shield logo, providing accessible water anytime on long trips. CBB-09: Bags are constructed of sturdy synthetic leather with a hook-and-loop closure that makes it perfect for storing smaller items and a zippered inner pocket designed specifically for storing sunglasses. Bag features an embossed Bar & Shield Logo.